Is this dog out of control? 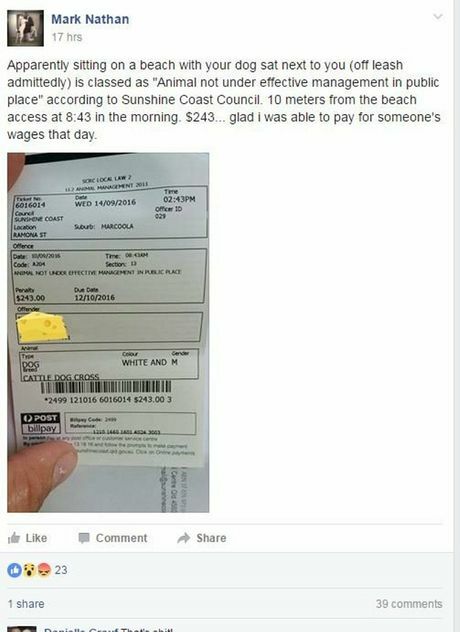 A PROFESSIONAL dog trainer reckons he copped a rough deal after being fined $243 at Marcoola Beach last week for an out of control dog. Mark Nathan, a Hendra-based dog trainer was visiting a friend in Marcoola last week and had headed down to the beach with his dog Buster, whom he rescued and began training, when he was fined $243 for not having proper control of Buster. Mr Nathan said his dog was sitting next to him, off-leash, on the beach, in between Mr Nathan and his friend, after they'd headed to the beach to do some filming of his training for his business website. He said he'd thrown Buster a cattledog/border collie 'bitsa' a ball after walking onto the beach before sitting down not far from the beach access. 'Out of control' dog showing off : Mark Nathan's dog was deemed out of control on Marcoola Beach. He says Buster is anything but. He's written to Maroochydore MP Fiona Simpson about the incident, telling her a dune buggy pulled up and two council officers approached, one of them explaining to him dogs had to be on a leash. Her office explained the matter was for the council. Mr Nathan said he apologised, explaining he was not from the area and hadn't seen the sign, before his details were taken and he was advised he would be getting fined $243 for the offence. He said the officer then directed him to the nearest off-leash area. He said the fine was "fair enough" as he'd been in the wrong, but he'd hoped they might've warned him rather than fined him straight away, given he was unfamiliar with the area. He said he didn't like the wording of the offence, arguing "not under effective management" made it sound like he had a "savage" on the loose. Mr Nathan posted a copy of the fine he received last Wednesday which stated the penalty was for "animal not under effective management in public place". Mr Nathan said as a dog trainer and behaviouralist, he believed Buster was well under control sitting next to him and he was also of the opinion that effective control was not limited to physical constraints. He said feedback on his social media post had been mixed, with some believing he had broken the law whule others agreeing the penalty had bene over the top. He said what had frustrated him was he'd seen someone running with three dogs on the beach only moments earlier, but to his knowledge they'd escaped unpunished. A council spokeswoman said the council took a "zero tolerance" approach to irresponsible dog ownership. "It is a dog owners' responsibility to ensure that a dog is on a lead at all times, unless there is signage in place advising it is an off leash area," the spokeswoman said.